Happy Labor Day everyone. 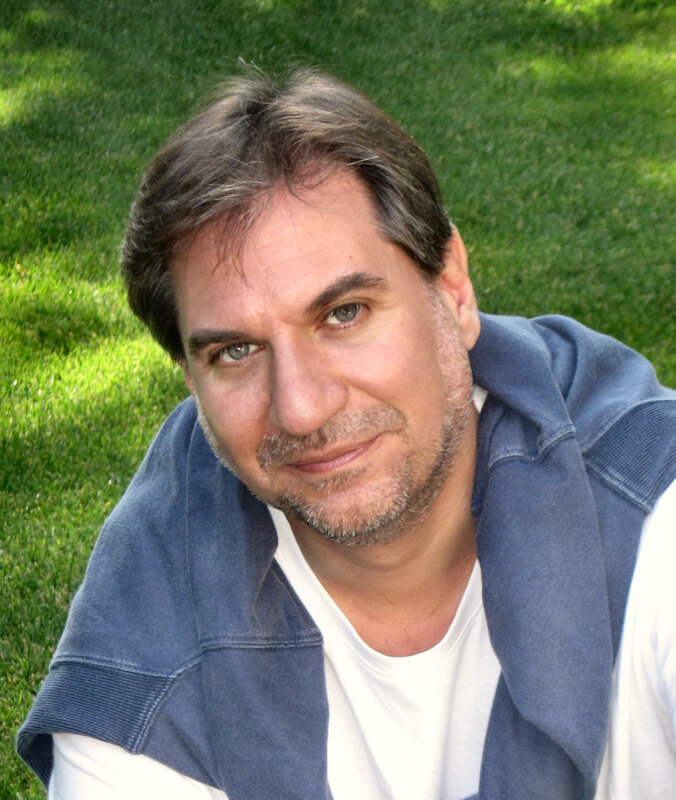 Today, I would like to welcome author Nicholas Rossis to my blog. What is your name, pen name and where do you call home? I cunningly chose my pen name, Nicholas C. Rossis, so that no one would figure out my true name, which is Nicholas Rossis. I live in Athens, Greece. What is the name of your most recent book and if you had to sum it up in 20 or fewer words, what would you say? What or who inspired you to start writing? And how long have you been writing? How did you come up with the cover? Who designed the cover of your book(s)? Ah, the cover… The obsession of many an Indie author. I design my own covers, but use illustrations by my talented friend, Dimitris Fousekis. He designs the various scales you can see in the covers, a different one for each book in the series, the varying materials signifying civilization’s progression. I then compose everything into a cover. Did you listen to any particular songs while writing your book(s)? I’m partial to the Dutch Classic FM internet radio station, as it allows me to focus on my writing. Especially since I don’t speak Dutch, so even the infrequent ads fail to bother me! How did you come up with the title for your book(s)? Pearseus follows the overall story arc of Herodotus’ seminal work, Cyrus the Great and Rise of Persia, which describes the fatal battle on Marathon between Greece and Persia in the 5th century BC. Only, my book is set in the future. As such, I had originally chosen the title Perseus for the series, but a good friend of mine, Mike Cardwell, asked me if I had considered how many other books are titled Perseus on Amazon. A quick search revealed over 10,000 books with that name! Obviously, something had to change, and it occurred to me to make it Pearseus instead, using a pun to justify the change. As for The Power of Six, my collection of short stories, I had posted the original name (Six Days a Week) and some draft covers on my blog. Fellow author Effrosyni Moschoudi suggested The Power of Six instead for the title, and I loved it, so I immediately adopted the new name. Do you prefer e-books, paperbacks, hard-covers or audio-books? I read everything, but prefer ebooks as they’re so easy to manage – and take no space in my luggage or home. As we’re about to be forced out of our house by a gazillion books overflowing from every nook and cranny, this is a much admired quality. I haven’t been able to get into audio books, though. I find the voice narration distracting, and I tend to lose focus after a short while. Are you a self-published/Indie author? I’m what I suspect most authors will be from now on: a hybrid one. I have self-published most of my books, but I’m about to publish my first children’s book in Greece through one of the oldest local publishers. However, I used my self-publishing experience to suggest a different deal to them, and they were kind enough to accept. I will cover the printing expenses and much of the promotion, while they will handle the distribution and part of the promotion. In return, I get to keep all rights and a far larger percentage than normal. If you’re a self-published/Indie author what made you go that route instead of the traditional publishing route? Turns out the answer is simple: fear. Have you ever read a book more than once? And if so what was it? Of course! For example, I’ve translated into Greek one of my favorite books, the Tao Te Ching. I spent a year translating some 80 pages, so I have read it hundreds of times. And yet, every time I read a verse again, I see it in a different light. What is your opinion of novellas? I love them. In fact, some of my best friends are novellas. Including my first book, Pearseus: Schism. I love their immediacy and the fact that they can be read in a single sitting. What is your favorite film based on a book? As a Tolkien fan, I’d have to go with Lord of the Rings. Game of Thrones is pretty impressive, too, although the series is slipping further and further away from the books. Oh, but I guess it’s not a movie, right? So, Lord of the Rings it is. What is your favorite book genre at the moment? Fantasy is a nice, all-encompassing genre. It can have sci-fi elements, like Pearseus, or be high fantasy, with brave knights saving kind dragons from evil princesses etc. In truth, however, I enjoy pretty much all genres, as long as they’re well-written. And not too dark; subgenres like Grimdark are, well, too dark for me. What books have made it onto your wish list recently? And why? Since I’m becoming fairly well known as an Indie author, I am frequently approached by other self-published authors who ask me to review their work. As I love helping out, most of my TBR list consists of such works. More often than not, they’re pretty good, too! I’d go so far as to say that some are great, like Nat Russo’s work. Effrosyni Moschoudi’s books are particularly well-written, too. What book are you reading at the moment? And in what format? I just finished the third book of Theresa Snyder’s Farloft Chronicles, and I’m about to start her fourth one. It’s a series of five novellas, each better than the last. Highly enjoyable! If you could invite any four (4) celebrities (alive or dead) to your dinner party, who would you invite and why? Okay, back to the question. I’d love to have Lao Tzu, Buddha, Jesus and Mohammed. That way, I could ask them to tell off all those using religion to tear humanity apart, instead of bringing people closer together. I’d have to pretty careful as to what to serve them, though. What’s the best advice that you have been given when it comes to writing? “Don’t let your writing get in the way of your story.” I came across this phrase somewhere on the Internet, and it was like a light bulb went on over my head. I repeat it all the time, and I even blogged about it last week. Do you have any hobbies that aren’t related to reading & writing? Also, I meditate and pray daily. It helps me ground myself. Finally, as my ever-expanding waistline can tell you, I love cooking. It’s almost as creative as writing! Not on the street, hopefully. I mean, that would be stalking, right? So they’re welcome to follow me on the information highway (how sad that I remember that expression, isn’t it?) instead. I’m all around the Internet, largely thanks to my day job, but the best place to start would be my blog, http://nicholasrossis.me/ . People can also read the first book, Pearseus: Schism, for free on Goodreads. Nicholas loves to write. His first children’s book, Runaway Smile, is about to be published. Mad Water, the third book in his epic fantasy series, Pearseus, was published in July. 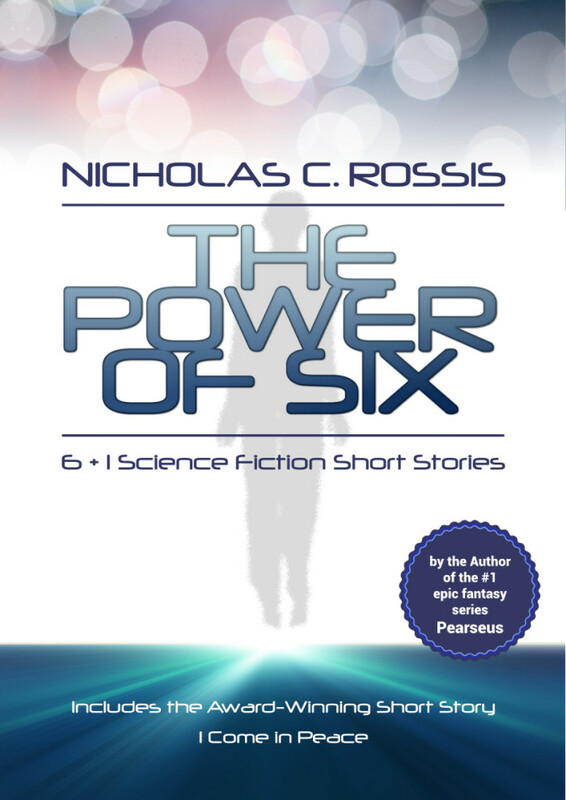 He has also published The Power of Six, a collection of short sci-fi stories. He lives in Athens, Greece, in the middle of a forest, with his wife, dog and two very silly cats, one of whom is always sitting on his lap. Oh wait, he just jumped off. No, really. He did. 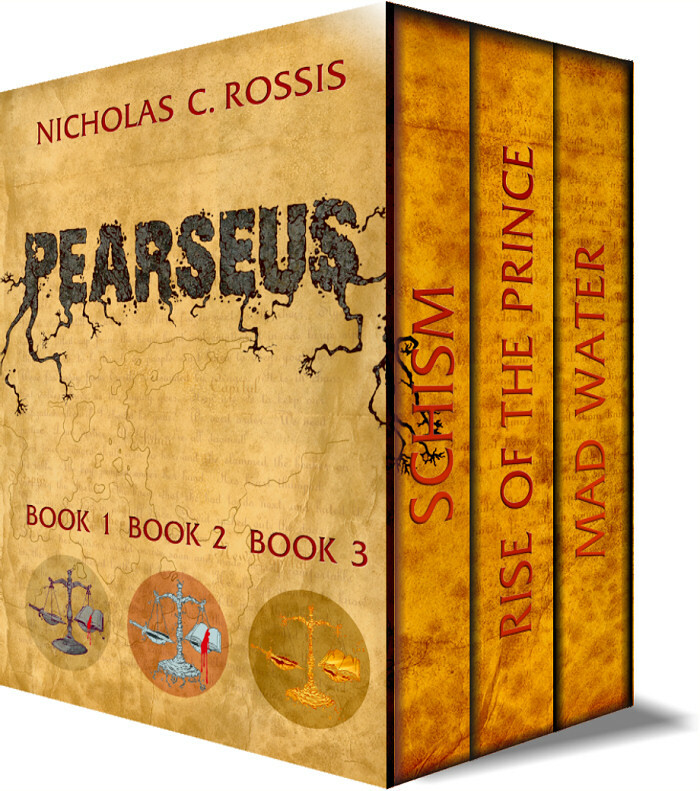 This entry was posted in Author Interviews and tagged Nicolas Rossis, Pearseus, The Power of Six. Bookmark the permalink.